There are a lot of rail operators across the United Kingdom & Europe. 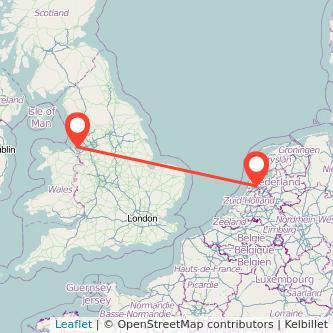 By searching for your ticket on gopili, you are able to see the trains between Liverpool in England to Amsterdam in Netherlands as well as the rail company for this route. The train is a quick and simple solution to travel to Amsterdam from Liverpool. The average train time from Liverpool to Amsterdam is 9h06m to cover the 336 miles. Fares can change quickly. We recommend you to launch a search to look at the latest available offers. Find the cheapest tickets to travel from Liverpool to Amsterdam by train, bus, ride sharing and plane. The table above is based on the best prices found over the last six months depending on how much time in advance the train is bought. Purchasing your train from Liverpool to Amsterdam in advance should enable you to spend less for your trip. We found tickets available from £203 when booking your ticket 7 days in advance which is 32% cheaper than the best ticket we found when buying your ticket 3 days in advance. We compare train ticket for all major companies to travel between Liverpool and Amsterdam by train and find the best prices for the coming days. Take a look at the prices of train tickets Amsterdam to Liverpool and find the best deal for your outbound journey.